We've written about CompStak, the CRE data provider, several times in the past, for good reasons. CompStak has a unique crowdsourcing model: brokers, appraisers and researchers join the service at no cost and trade commercial real estate lease comps on the platform. Landlords, lenders and investors can access the data through a paid subscription. CompStak started in NYC, and now covers 14 US markets offering valuable information that is difficult to get anywhere else, such as tenant names, the dates they signed leases, and the actual rent and square footage of the leased properties. CompStak's model has received lots of attention in the US, and it seems that Europe is paying attention as well. The company recently won the MIPIM 2015 Open Stage competition, and will host a panel about the power of the crowd in front of the MIPIM audience this Thursday. We spoke with Michael Mandel, a former CRE broker and the CEO of CompStak about the significance of the award and the company's future plans. Q - CompStak won the Open Stage competition at MIPIM 2015 in Cannes. Whats the significance of this award to you? We are very excited to have been selected to present at MIPIM this year, and the award is significant for several reasons. First, MIPIM is one of the world's largest property conferences, and being selected to speak there is a very strong endorsement from that organization. More impressive is that our proposal was voted up by the MIPIM audience, and we won by a large margin, which further proves that our model and message is interesting to commercial real estate industry participants not only in the US, but also in Europe. Second, it is significant because we get significant visibility to the the MIPIM audience, which I expect to generate a lot of opportunities both in the US and in Europe. Q - Can you tell us about MIPIM? Does CompStak have a significant pretense at this event and who attends it? It is a huge real estate conference and expo that takes place every year in Cannes, France. MIPIM is attended by 21,000 property professionals, and all the significant players go there to exhibit, network, and learn about industry trends. This is the first time we're attending, and we will be participating in two sessions. The Power of the Crowd is an hour-long program that we've put together with Realty Mogul and Fundrise, where we get to showcase how companies like CompStak are able to gather resources and data faster and at lower costs by leveraging crowds. 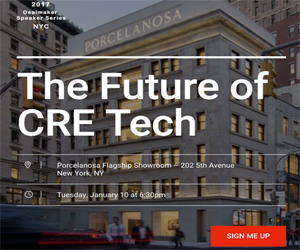 I will also be doing a 4-minute pitch of CompStak at an event dedicated to disruption in real estate. Q - Is international expansion part of your overall business strategy at CompStak? Yes. We have our eye on several European markets, starting with London. If that goes well, we'd like to offer CompStak in other cities. Canada is another international target on our radar. Q - How does Compstak differentiate itself from the other data providers in the marketplace? Hiring an army of researchers to call CRE brokers for data, or 2. Scraping public sources. Both ways are far from perfect. Brokers do not like to share data if they don't see a direct benefit, and the cost of a large research team makes data very expensive. Data gathered this way also has questionable accuracy. Scraping public sources does not provide data that is not recorded publicly or data that only exists in the collective knowledge of the CRE community. For example, lease transaction data. On the other hand, CompStak, using crowdsourcing, is able to create and maintain a large database with a small team of high-level data scientists. Each one of our members is really a researcher. We're able to gather a massive amount of data at very low cost, and and incredibly high level of accuracy. Another difference between CompStak and other data services is that we treat our members as partners. The relationship is not purely transactional – it is a database that they create, and they know that the more they contribute, the better it will be for everyone. This collaborative community is a breath of fresh air in the highly competitive CRE industry, and we’ve got some very big fans out there. Q - What are some of the new tech initiatives you are working on? We just relaunched our Enterprise product for lenders, landlords and investors. The new version increases usability tenfold and is loaded with new features. We are also working on a set of analytical tools for underwriters and asset managers to be released in Q2. So far, our beta tests have proven that our customers really need those tools that allow them to benchmark their assets against their competitors' and underwrite new acquisitions. Internally, we keep improving our ability to sort through, validate and load a massive amount of data into the system. Q - How is business these days? Business is great! We expanded our roster of customers to include most of the large money center banks - JPMorgan Chase, Wells Fargo, etc., and the world's largest real estate investors like Equity Office Properties, Carlyle Group, Tishman Speyer and many others. We are working on expanding into several new US markets and increasing our sales accordingly. We've set big goals for 2015, and we're on track to hit our targets.